The U.S. Agency for International Development (USAID) is partnering with Janssen Pharmaceuticals on the Bedaquiline Donation Program, an initiative to expand treatment for multidrug-resistant tuberculosis (MDR-TB) in low- and middle-income countries. Janssen has committed to donating 30,000 6-month courses of bedaquiline over a 4-year period, with USAID working in parallel to provide recipient countries with technical assistance that will ready their health systems to integrate these new medicines, ensure their rational use, and monitor and manage adverse events with patients. 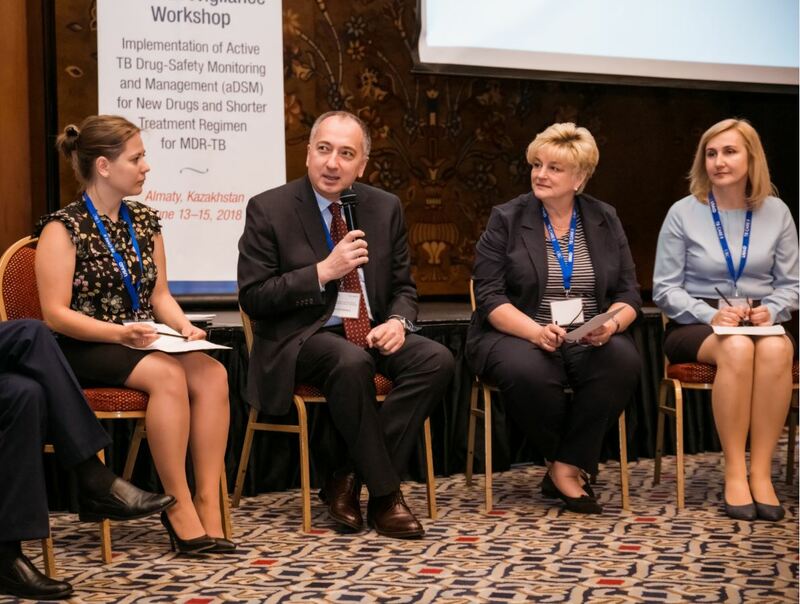 As part of USAID’s health systems strengthening support, the Agency’s TBCARE II Project hosted a workshop titled Central Asia and Eastern Europe Regional Pharmacovigilance Workshop: Implementation of Active TB Drug-Safety Monitoring and Management for New Drugs and Shortened Treatment Regimens for MDR-TB from June 13 to 15, 2018, in Almaty, Kazakhstan. In addition to host-country nationals, participants in this knowledge-sharing event included TB program stakeholders from Armenia, Azerbaijan, Belarus, Georgia, Kyrgyzstan, Moldova, Tajikistan, Ukraine, and Uzbekistan, as well as representatives from other USAID-funded projects and the World Health Organization (WHO). Archil Salakaia, Manager of Core and Commonwealth of Independent States (CIS) Programs for the USAID-funded Promoting the Quality of Medicines (PQM) program, moderated a panel of National Drug Regulatory Authority (NDRA) representatives that was convened at the workshop to share experiences and challenges in introducing new anti-TB medicines and in enhancing collaboration among NDRAs and National TB Programs (NTPs). The panel conferred on best collaborative practices for the implementation of active TB drug-safety monitoring and management (aDSM), a discussion that paved the way for a follow-up session in which NDRAs and NTPs worked jointly to develop country plans for strengthening their aDSM systems. The panel also focused on the need to streamline authorization of new products for local markets, as cumbersome registration practices for new medicines may create barriers in terms of sustainable access to priority medicines. The World Health Organization (WHO) considers MDR-TB be “a public health crisis and a health security threat.” WHO’s Global Tuberculosis Report 2017 estimated there were 600,000 rifampicin-resistant cases (including 490,000 MDR-TB cases) that were eligible for MDR-TB treatment. Efforts by the international community have resulted in new treatment approaches for MDR-TB in the last several years, including development of two medicines, bedaquiline and delamanid; introduction of a standardized shorter MDR-TB regimen; and use of repurposed drugs (e.g., clofazimine and linezolid). WHO and its partners require countries to implement active TB drug-safety monitoring and management (aDSM) systems as part of introducing new anti-TB medicines.